The Article: Mississippi governor: Educational troubles began when ‘mom is in the workplace’ by Valerie Strauss in The Washington Post. The Text: Mississippi Gov. 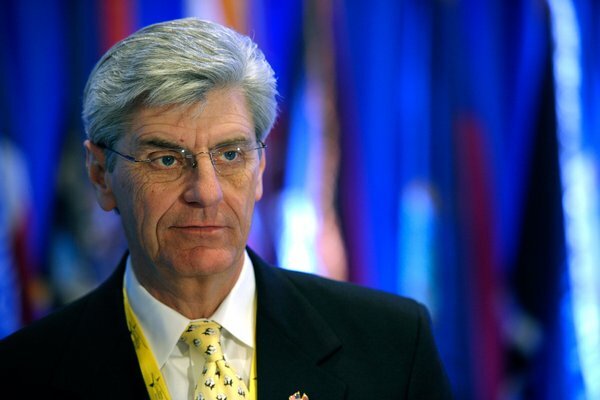 Phil Bryant (R) said Tuesday that America’s educational troubles began when women began working outside the home in large numbers. I think both parents started working. And the mom is in the work place. Bryant immediately recognized how controversial his remark would be and said he knew he would start to get e-mails. He then expanded on his answer, saying that “both parents are so pressured” in families today. He also noted that America seemed to be losing ground internationally in regards to educational outcomes because other nations began to invest more in their own school systems and make progress. Bryant was speaking at on a panel that also included Delaware Gov. Jack Markell (D) and New Mexico Gov. Susana Martinez (R). The event was co-sponsored by The Annie E. Casey Foundation, the GLR Campaign and the Winthrop Rockefeller Foundation in Arkansas. During a conversation about what states are doing to increase reading proficiency, the moderator of the panel, award-winning Washington Post journalist Mary Jordan, asked the three governors how America got “so mediocre” in regard to reading proficiency rates and educational outcomes. Bryant answered first. There is a lack of urgency on the part of the public … that we are in a new world. Martinez said that lack of urgency was the adults’ fault. “Education became adult-driven and not child-driven,” she said, a common refrain of some school reformers who have attacked teachers and their unions for being more concerned about their own needs than the needs of the students. Martinez said that 99.9 percent of the teachers in her state, New Mexico, are rated proficient, but added that ”obviously that can’t be true,” because only 70 percent of students graduate from high school. She did note that New Mexico’s high school graduation rate jumped from 63 percent to 70 percent in 2012. But she did not say that the 2012 graduating class did not have to take a high-stakes exit exam as previous classes had.